How young adults are affected by media is important to their overall health and development. This tip sheet will help you understand how media can positively and negatively affect how they think, act, learn, and grow. Although most young adults are at a stage in life where they are choosing media on their own, use this tip sheep as a guide to help you talk with and advise them about their media use. Young adults watch a lot of video content. Encourage your young adult to take up other hobbies and begin habits that promote a healthy life balance that includes friends, family, work and/or school. Reading at least one book for fun (outside of work and/or college) can lead to further reading in young adults. Encourage your young adult to read for fun. Share book recommendations and talk with them about what they are reading. Many young adults listen to music through headphones at high volumes, which can damage their ability to hear later in life. Encourage your young adult to listen to music at moderate volumes to avoid hearing loss. Many young adults continue to be active on social media. Connect with your child on social media to help remain actively involved in their life and to be available for support. Young adults may use dating apps for their romantic relationships. Encourage your child to be safe when meeting someone in person for the first time. Young adults, and particularly, college students, who view alcohol-related images on social media may think this behavior is expected of them. Talk to your child about what they see their friends doing online and about any peer pressure they experience. Young adults may spend a lot of time playing video games. Encourage them to include other non-gaming hobbies in their lives. 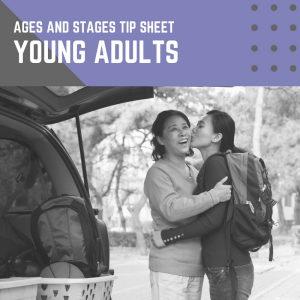 Talking with your young adult about their life and shared interests can help maintain connectedness. Use Skype, Facetime, or other video chat services to keep the lines of communication open if your young adult no longer lives at home.